News To Me: THE DEVIL ON WHEELS AWARDED PROJECT OF THE MONTH ON INDIEWIRE! THE DEVIL ON WHEELS AWARDED PROJECT OF THE MONTH ON INDIEWIRE! 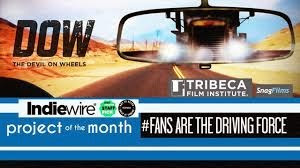 The Devil On Wheels, the feature documentary project about Steven Spielberg's Duel, has just been awarded Project of the Month on the prestigious independent film website Indiewire. The film is now a candidate for the 2015 Indiewire Project of the Year award to be held later in the year. The documentary will celebrate the making and the cult surrounding Duel, the first well known film created by Steven Spielberg. A small shot-for-TV film, Duel has astonished many film fans by generating an ongoing cult for more than four decades. In Duel, a Movie-Of-The-Week shot in 1971, a terrifying truck, whose driver we never see, for no apparent reason chases a lone driver along the desert roads of Southern California. Such was its success that the film was extended and distributed as a film worldwide. Duel fans from all over the world regularly visit the film locations in the desert next to Los Angeles. They go to see the surviving truck in North Carolina. Film experts discuss its meanings. Would-be filmmakers analyse the way it was made. Steven Spielberg’s first known work has become a top cinematic reference, an iconic piece of filmmaking and its influence is still fresh to this day. Director Alfonso Cuaron revealed he used Duel as a reference when he made “Gravity”. Why a tiny film, made cheaply and quickly for TV, has generated such a passionate, international and undying cult, is the question the documentary wants to answer. THE DEVIL ON WHEELS will find out what makes Duel so unique, looking deeply into the Duel's phenomenon and in doing so, it will explore the power and fascination that films have on people. The documentary will be shot in the USA by a team international Duel lovers who will travel the country exploring the Duel phenomenon: interviewing the surviving members of the crew, reconstructing the way the movie was made, and meeting other fans and experts to discuss the ongoing appreciation of the film. The filmmakers have created a website, www.thedevilonwheelsmovie.com, which for the first time gathers in one place all Duel related information that can be found on the internet. The Facebook page www.facebook.com/thedevilonwheels will serve as a meeting point for the fans. An actual gathering with Duel fans is planned in one of the locations during the shooting of the documentary. Director Enric Folch, a multi-award winning TV director in Spain, returns to documentary making after the excellent international reception of Chining Me, an ironical view on pre-Olympic China. His most successful TV film Tempus Fugit will soon have a theatrical remake through an international coproduction. The title of the documentary, The Devil on Wheels, is the straight translation of the Spanish title of Duel, and it's been chosen as an homage to the worldwide recognition of the film. I dig watching weird and horrorific movies and then telling my friends about them.